What do you think is the greatest skill position and biggest variable in the bakery? The mixer operator! Let me tell you why. What’s on the Spec Sheet? Protein, moisture and ash content all contribute to mixing time and speed decisions. What kind of mixer is being used? Some mixers have more automated features, while others have a more hands-on approach. Either way, the operator needs to know the ins and outs of the equipment, and what the challenges are. This one is key because it’s the easiest way to control final dough temperature. It has a great impact on final dough quality. What’s the air and flour temperature? Although your operator may not have control over these factors, they will need to adjust mixing speed, time and water temperature to compensate for them. 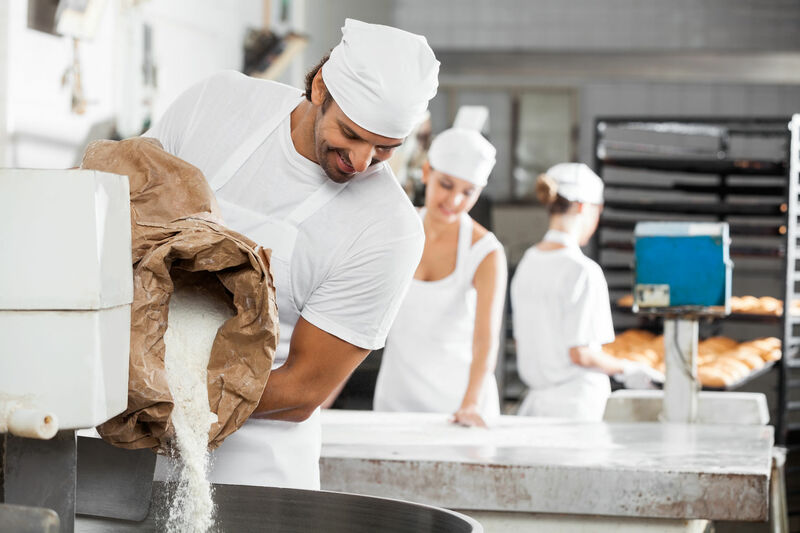 All of these factors contribute to one of a bakery’s biggest concerns: doughs that “tail out.” Especially with large batches, the dough hitting the makeup line normally looks quite a bit different from the front to the back of the dough. This is due mainly to incomplete hydration and the temperature of the dough. Free water takes time to absorb into the dry ingredients. Normal oxidation occurs, too. If you’re looking to make your mixer operator’s job easier and stop tail out, then consider our patented Rapidojet technology. The flour is shot with a high-pressure stream of water. It is fully and instantly hydrated. Gluten structure is instantly developed. Minors and micros are then added at the legacy mixer. Final mix time in the legacy mixer is reduced by up to 65%. Operations dealing with tail out have found a solution with Rapidojet. A more consistent final product that doesn’t “tail out” due to complete hydration, lower dough temperatures and shorter mix times. Up to 65% reduction in mix time in the legacy mixer because Rapidojet instantly develops gluten structure. Increase in total yield of about 8% because Rapidojet creates a much more homogeneous bond between flour and water via our patented use of high pressure. Much less ice or glycol is required because in the 4-5 minutes of mix time (previous time was 12 – 15 minutes) not as much heat or friction is generated. Longer shelf life because staling through starch retrogradation is substantially slowed. Free water is mostly eliminated. To learn more about cutting your mix time in half, and the ROI with Rapidojet, click here.